SMS Psycho Fox (USA/Europe) "warpless" in 12:43.92 by The8bitbeast. Psycho Fox is about furry animals out to stop the evil Madfox Daimyojin, using their trusty bird friend as a baseball to knock out enemies. This run from The8bitbeast completes the game as fast as possible, while forgoing warps. For more details, please read the authors' comments. 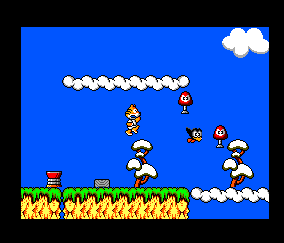 There is also a run of this game, which completes the game with warps.